My inspiration for this quilt design was a photograph of Shibuya Crossing (the world’s busiest intersection) in the rain. Initially, I planned to put the crosswalk strips on an angle, but when I laid out the actual strips, it just didn’t look good, so ended up setting them straight. You may recognize the colourful fabric strips from some of my other quilt designs. Isn’t it a fabulous, bright mix? This fabric selection just keeps on giving; I still have a big stack to use in another project. I used 9 by 2 inch strips of my rainbow selection, interspersed with off-white. I think a scrappy mix of off-whites would also look great in this design, and definitely a black or grey background would look great. I quilted it first with the large divided circles which are meant to represent umbrellas, then filled in between the umbrellas with small circles to represent rain. Overall, I like the resulting texture. I have a great idea for another Crosswalk quilt. The strips and background would look like the album cover for Abbey Road, then outlines of John, Paul, George and Ringo could be quilted on. Wouldn’t that be fun? Maybe next time. As you may recall, in a recent quilt challenge with my mother, we both agreed to create a quilt based on the Colourbust pattern from By the Block. We agreed it would be a queen-size quilt, so knew that the lap-size pattern would need to be adapted. The two of us had an initial meeting which included fabric sharing and discussions about colour scheme. My quilt, which I named Singin’ in the Rain ( because it reminds me of a rainbow viewed against a stormy sky), uses 4 1/2 inch strips, and includes a 2 inch border of a bright fabric matching each block. I found a fabulous Northcott wide flannel for the backing. Mom and I met at Sewing Machines Etc. in Burlington, where we spent the day quilting on longarm machines with the expert help of Jane. We hadn’t seen each other’s quilt top beforehand, so the big reveal was fun. Hers is gorgeous ( and the subject of a future guest blog)! I have to say Mom’s quilt is much less tame than mine, and she also gained points with her beautiful pieced backing. What I love about my quilt is it’s a great size for the double bed in my teenage son’s room, and it’s extra warm with the flannel backing. It’s a nice bright modern look for a teenager’s bedroom. After this experience I found myself vowing to make a large quilt for my own bedroom, because I just love all the overhang. 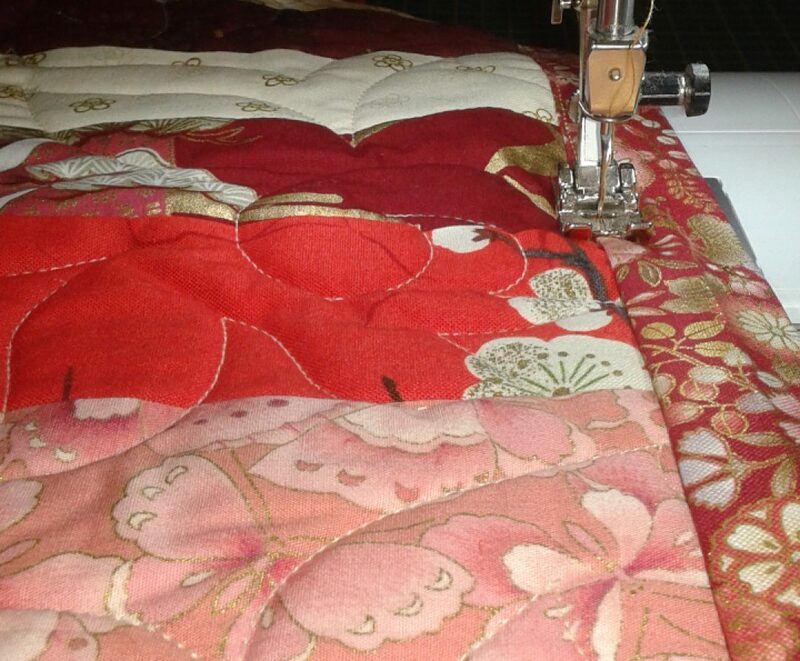 It was a lot of fun having a challenge with a deadline, and such a treat working together all day on the quilting. Thanks Mom! I decided to go ahead with a small improvement to the bathroom: a basket to neatly stash soiled handtowels awaiting laundry day. The resulting basket is a repurposed doll quilt, in response to my quilt-cutting challenge. Very little cutting was necessary; it was mostly folding, like origami, and sewing into place. I used to love making origami boxes when I was a kid, so this was entertaining and easy. It’s great how it stands up on its own without collapsing, and its bottom is pleasingly flat. It’s also handy that it can be tossed in the wash along with its contents. I’d like to experiment with Velcro for a less permanent basket. I haven’t finished with the quilt-cutting challenge yet; I dug out a large quilt that I never use, and am planning to make a couple of quilted bags from it. If you are taking up this challenge, I would love to see your pictures.